It looks like there is an incompatibility between windows 10 and the way foobar2000 registers itself as the default application for filetypes. Opening an associated filetype through the windows explorer works absolutely flawless, but when I try to open the same file through the windows search results, I'm always asked if I want to keep using foobar2000 to open this file, or use a different application. This problem happens with every filetype I associate with foobar. Other applications, like VLC, WMP, or MPC, don't have this issue and simply play the file like they should. I tried the stable version 1.3.8, as well as the newest 1.3.9 Beta 4. Is there anything that could be done about this, or do we need to wait for a new version of foobar that fixes this? Have you checked the box for "Always use this app to open .wpl files"? If you do not, Windows 10 will not save the default association and will continue to ask. Well, I can reproduce this, at least. Have you checked the box for "Always use this app to open .wpl files"? Yes, of course, and it doesn't make a difference, here. It will still ask the next time. I tried this myself just now and even after confirming I wanted to use foobar2000, Windows sent the file to MediaInfo the second time around. When I right-click on the file, MediaInfo is the first option listed for target applications, so it's possible that this is an issue with Windows itself (e.g., Windows is following the first target function it comes across rather than obeying file associations). Should be fixed in 1.3.9 beta 5, thanks for reporting. Please note that I'm reverting this fix. Could be a also bug in our shell extension code, but it's a retarded design that we even need this shell extension just to provide properly working commands in Explorer, I don't even want our code running anywhere near Explorer process! To make long story short, Microsoft just can't provide a clean way to send more than one file from Explorer to an application. They had a chance to fix it each time they released a new major Windows version, and they've not done anything about it for the last 20 years as far as I am aware of. One foobar2000 process per file - messy, inefficient, no way to know when they've finished sending us files other than using a delay timer, which introduces an annoying delay between clicking files in explorer and foobar2000 UI response to it ( like this ). It's worth mentioning that Mac OS X Finder does this right, a group of items gets properly delivered to the app without spurious process instances or other issues. I'm also considering the possibility of making the shell extension opt-in as it is not necessary for the rest of our app to function. The only difference is that without it, interaction with Windows Explorer will not be as smooth, all play/enqueue actions will be slightly delayed. That's an interesting one. Apple have always maintained a one-to-one relationship between programs and processes. A program is either running or it isn't. When you address a program (AppleScript or Apple Events) you are doing just that: addressing a program. If it's closed, it opens. If you select several files and double-click one of them, the only option the Mac conceivably has is to pass them all to the program, creating its one and only process if necessary (and it does help that the program receives the whole list collectively). The idea of having several instances of the same program in separate processes is totally alien to the Macintosh concept. Getting back to the bug, I am intrigued how old it is. I never had this bug in Windows 8 or 8.1. I upgraded to Windows 10 in December, and still never had this bug. The bug only started for me sometime in the last few months: I don't open many files from search, but at the end of June, after recently updating Windows 10, I suddenly noticed that search results always prompt me to keep using the program I was always using. I though that something new had triggered it, while clearly it's much older. As for the extension — I hear you. 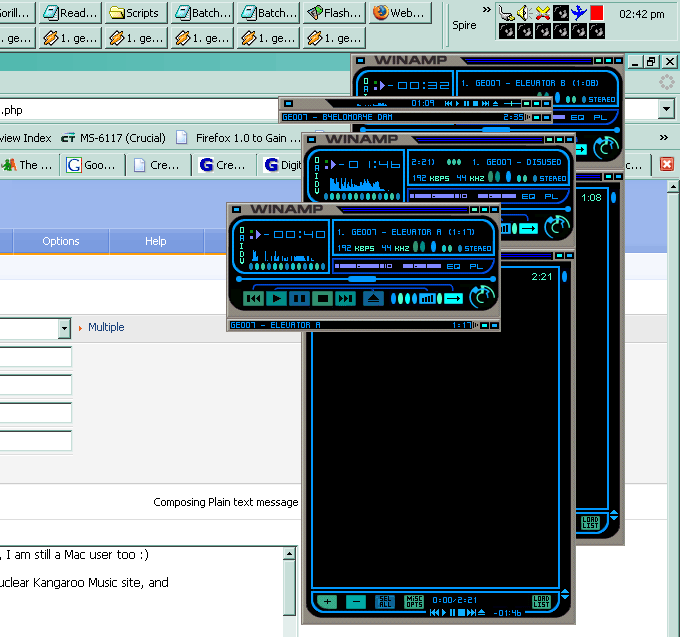 I remember the pain of dealing with multiple files in Winamp in Windows 2000, which was a real mess. It never actually occurred to me that foobar2000's enqueue facility was actually completely impossible and shouldn't be working. Now I realise what the shell extension is for, and it all makes sense! I think my choice would be the extension, as I probably enqueue batches of files more often than I launch from search, and so long as I know that Windows itself isn't collapsing in on itself, I can live with an extra enter keypress. If you want me to test new builds though, I'm happy to oblige. What has the Windows' problem with sending multiple files to an app in common with missing context menu item? Windows supports "verbs" — a set of actions that can be performed on a file, such as View, Edit, Print, Compile, Enqueue etc. Deficiencies in Explorer can be solved by installing a program inside Explorer (a "shell extension") to gain the behaviour you should have had in the first place; shell extensions are plugins for Explorer that extend its functionality. That's what foobar2000 does, and the shell extension is causing problems of its own in Windows 10. I notice that I get this same bug in Outlook 2013 with my custom zip file expander, and that could potentially be due to the 7-Zip shell extension that handles zip files (my expander is just a wrapper around 7-Zip). If I understand correctly, the foobar2000 shell extension overrides or replaces the verbs with a more intelligent behaviour that hands all the files together to foobar2000, and this is where you can get missing or duplicate commands in the context menu for files. Enqueue missing from M3U isn't related to recent foobar2000 changes or bugs in Windows 10. It is missing by default on Windows 7, 8/8.1 and 10 but works on Windows XP. Somehow Windows Media Player's commands are shown instead of foobar's for this file format. If this is your issue and you don't need WMP it's easy to solve by disabling the program. You can type "computerdefaults.exe" in the Windows search bar and run the program. Click on the Custom line and untick "Enable access to this program" from Windows Media Player. Oh, that's a whole other bundle of joy. I don't actually want to remove WMP, so I use the Registry tweak, of simply deleting the WMP actions from the Registry, such that the program remains accessible but doesn't clobber other programs. Didn't Microsoft learn anything from its encounters with the Department of Justice in the past?